"Holiday Celebrations From Around the World" is an exclusive program from Thompson Hospitality and Compass Group that showcases a wide array of cooking styles and gives customers a special experience to complement the holiday season. These menu items are selected as special dishes from countries across the globe. Start planning and marketing now for a successful holiday season! 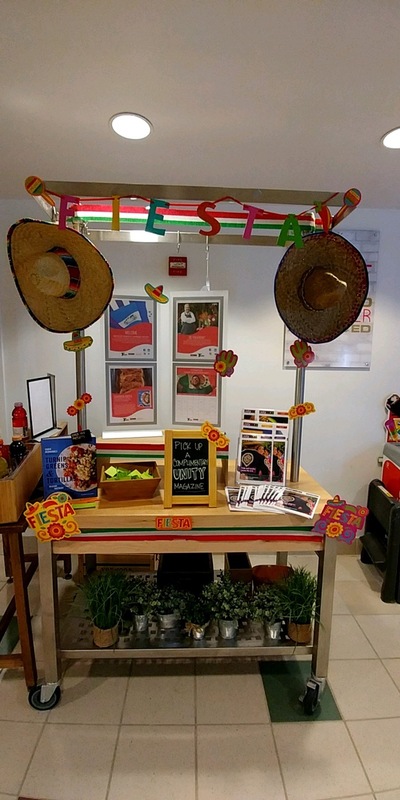 The display was a joint effort between Aja Beard and Judith Martinez, the catering coordinator. An exclusive program from Thompson Hospitality and Compass Group that showcases a wide array of cooking styles and gives customers a special experience to complement the holiday season. These menu items are special dishes from countries across the globe. Start planning and marketing now for a successful holiday season! Connect with diners by providing our exclusive reading material at your location. Each month, Our Cultural Calendar and Entry Signs are filled with fresh, engaging information for your customers to enjoy. Add a little excitement by posting our monthly Cookbook Raffle sign at your location. For directors and others making presentations to clients, the PowerPoint slides provide a quick snapshot of our diversity content.